After years of taking photo slides of days gone bye and now not being able to view them after ridding myself of the screen and projector, I decided to convert them to a digital format via the Wolverine F2D 20-Super Film to Digital Converter. It does a decent job but the best part was revisiting times gone by. 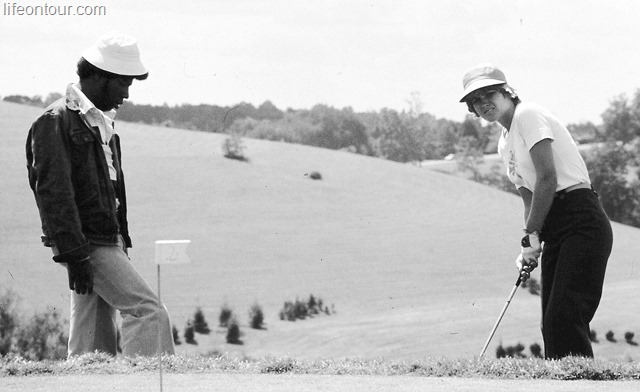 One was my visit to Wheeling WV in ‘77 for the LPGA Wheeling Classic held on the Speidel Golf Club at Olgebay Park Resort. This was the last year of civilian life for me before my caddie career took hold. But that’s for a different time. For now, it’s worth a look back to those early years. The color has faded so I made some B&W but the content is what counts. Is this Jesse with Debbie Meisterlin? No idea. Does anyone know? Meijer Classic notes: Someone mentioned that this driving range makes the one at Corning look big. Players may go to a different golf course to warm up. Only holes 9 and 18 are the same as members play. 1 through 8 are switched with 10 through 17. The Corning range was so small a waiting list was eventually created as in a restaurant. I believe this was the place where JoAnne Carner, looking for a place to warm up for the pro-am, approached a rookie on the range and asked if she was in the pro-am. After receiving a negative reply, JoAnne made it clear who gets priority in situations like these. “You’re in my spot.” she said. Also, this is another field that failed to fill. I guess there are just too many events. This entry was posted on Thursday, August 7th, 2014 at 5:46 pm and is filed under Uncategorized. You can follow any responses to this entry through the RSS 2.0 feed. You can leave a response, or trackback from your own site.